Officially the station is named "Stesen Sentral" but most people refer to it as "KL Sentral". KL Sentral, or Kuala Lumpur Sentral. KL Sentral is the main railway station of Kuala Lumpur and connects the city with Singapore, Thailand (via Butterworth) and Kelantan (eastcoast). Most train connections are still quite slow (except for a new rail connection to Ipoh) at the time of writing but it is still a good choice if you want to take a night train in a sleeper car or experience the local culture and spectacular views of the rainforest on the way to the east coast. The train station itself was opened in 2001 and replaced the beautiful old Railway Station which served the trains in KL since 1910. Now only local KTM Komuter trains stop at the old railway station. KL Sentral, said to be the biggest railway station in Southeast Asia, is a transportation hub connecting local trains (LRT and KTM Komuter), long-distance trains (KTMB - to Thailand, Singapore, Kota Bahru), KLIA Express (express train to KLIA airport), Airport buses to LCCT (Skybus, Aerobus) and KLIA (Airport Coach) as well as Local RapidKL buses. The Monorail station "KL Sentral" is nearby but not directly connected to the train station. 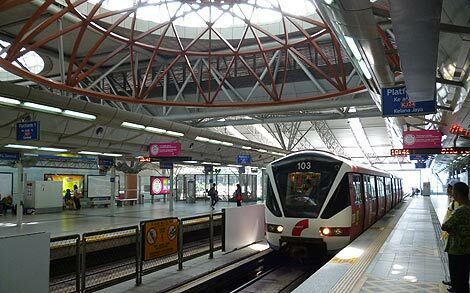 The LRT station of the Ampang Line is located above ground while the KTM Komuter train, KLIA Express and the long-distance trains are underground. There are plenty of restaurants (McDonald's, KFC, Subway and several local restaurants), shops and a market in the main hall to keep you entertained as you wait for your bus or train. 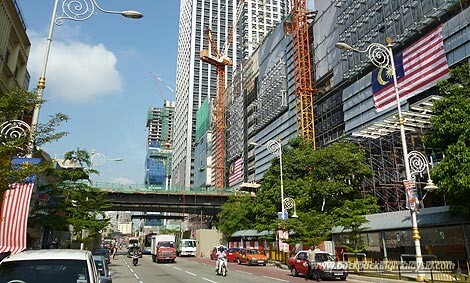 Once the Nu Sentral shopping mall will open just across, there will be plenty more things to do. Just across the exit at the KLIA Express departure area is Sooka Sentral. Sooka Sentral is a "Lifestyle Centre"offering a food court, spa, gym and a dance club. From the same exit you can also walk to Brickfields in 3min (just walking along the exit ramp for cars to Jalan Tun Sambanthan. Once you get to Jalan Tun Sambanthan turn right and you will get to "Little India" in Brickfields - an area with many Indian shops and restaurant. 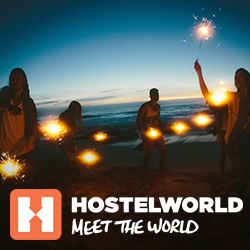 Well worth a vist! Even though the Lake Gardens and the National Museum is right opposite of KL Sentral, it is virtually impossible to get there directly since you will have to cross several major highways. 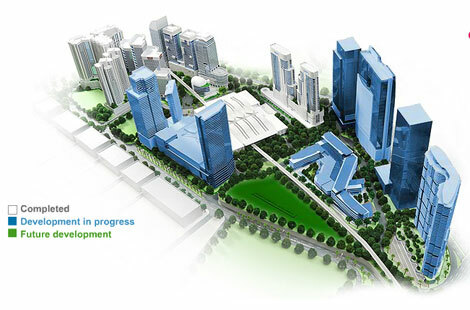 Hopefully the city build pedrestrian bridges in the future (as there are currently build at several places in KL). 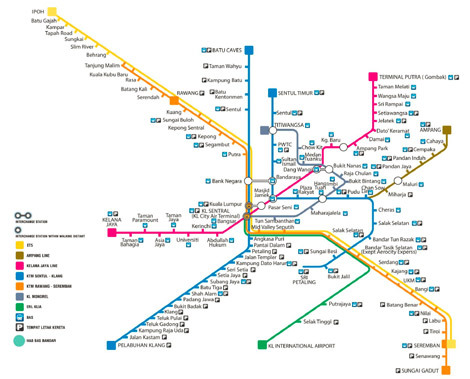 It would would easier to talk the LRT to Pasar Seni and walk from there. If you take a taxi from KL Sentral, make sure you buy the taxi coupon at the upper level. The taxis downstairs at the bus stop will overcharge you. Be aware that the taxi counter is closed between 4am and 6am in the early morning. So if you arrive at KL Sentral at that time you are most likely to be overcharged. The normal rate of a taxi to hotels in the city center is RM13 (with a 50% surcharge after midnight - the midnight surcharge already starts at 11.45pm) with a coupon, while some tourists have been charged prices up to RM50 once the coupon counter closes. 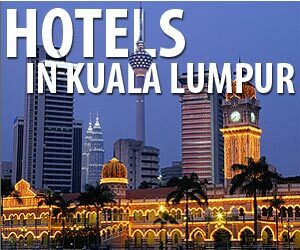 There is a great service if you are flying with Malaysia Airlines, Royal Brunei, Cathey Pacific, Emirates or Etihad Airways. If you take the KLIA Express train to the airport, you can already check-in and drop-off your luggage at KL Sentral. 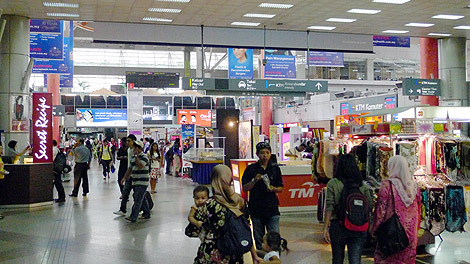 The check-in counters are right across the KLIA Express ticket counter at the KLIA Express depature area. You need to buy the train ticket first and present it at the check-in counter to use this service. Most tourists come to KL Sentral to take bus to LCCT airport (flying with AirAsia). The buses stop at the basement level below the train station - so brace yourself for a dose of noise and air pollution with the engines of the buses running non-stop (and the constuction around) in the confined space. 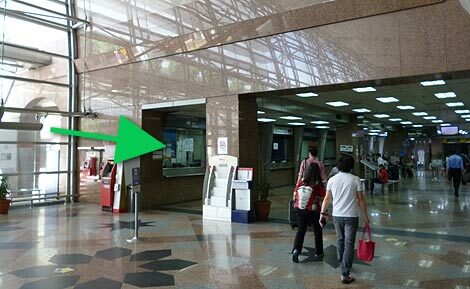 Besides the buses to LCCT (Skybus or Aerobus - buy tickets straight at the buses), you can also find ticket ticket counters for Airport Coach (to KLIA) and to Genting Highlands at the same place. The local RapidKL bus are at the other end of the basement bus area. The award-winning International Airport of Kuala Lumpur is located about 50km south of Kuala Lumpur. The Puduraya bus terminal (now renamed to Pudu Sentral), located in the city centre, used to be KL's main bus station but most most operations have moved the TBS bus terminal. 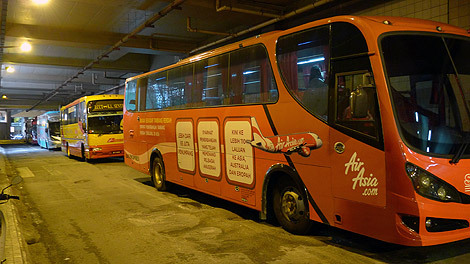 Pudu Sentral now only serves few buses to Genting, Seremban, Sabak Berenam (Kuala Selangor), Tanjung Malik.